As for my license, I am not allowed to ride a motorcycle with an engine capacity of 401 cc and over. My scooter is 250 cc and is enough in daily life and for long tours, but I have dreamed of motorcycles over 1000 cc since my college days. I know such big motorcycles are of no use in ordinary life. However, I have thought of lifting the restriction for about 30 years. I tried to do it many times and hesitated at the same time. I'm afraid I might have remorse later and made up my mind to enlist for the driving school today. Do you know Tsushima Island, located between South Korea and Kyushu in the southern part of Japan? This island had been a depopulated island, but it lies near the border with South Korea and I can't describe the importance of the island. Though I wrote about Takeshima island before, this Tsushima island is different from Takeshima. There's a serious issue about Tsushima Island that I'd like all the people in the world to know. To stretch the point a bit, Tsushima Island is being invaded by South Korean people now. Some people are going to enjoy fishing there, because the sea around the island is clear and rich in fish. It is ok, and I hope their visits will make the island prosperous. 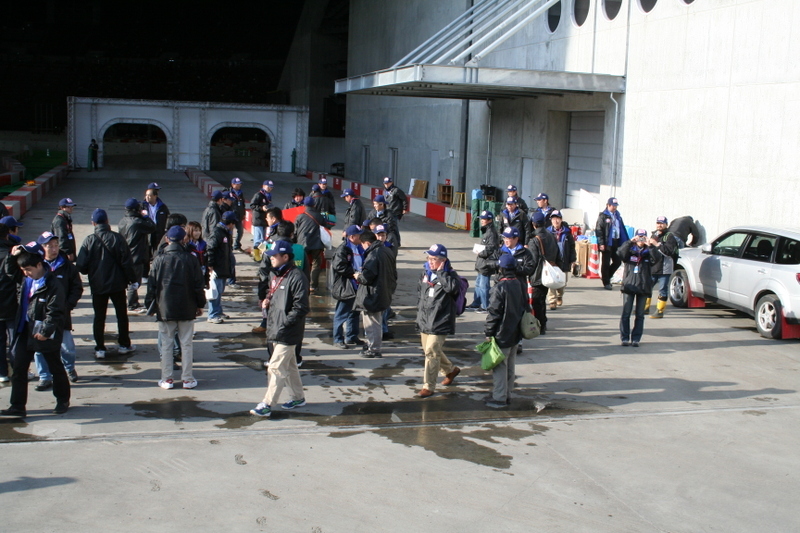 However, many Koreans run wild everywhere on the island. They buy up the real estate around the coastguard base concealing their real nationality, run guesthouses, some of which would end up being breeding places for stowaways, smuggling and hiding places for bands of robbers. Some throw their garbage away here and there. Others plant Hibiscus Syriacus on the island that they brought in without permission, which is also the national flower of South Korea, and shout loudly that Tsushima is South Korean territory. Their impudence is too much to tolerate. What is their mentality like? What is their educational system like? I cannot find suitable words for it. I had fits of obligation for cleaning my room after seeing dust bunny on the floor of my room. I brought the electronic vacuum cleaner up from the stock room downstairs and started cleaning. Just when I started, my youngest daughter A shouted, "Noisy! Stop the cleaning! You should use the cleaner in the daytime!" My room and my youngest daughter's room are next to each other. I thought she had a point. It was a bother for me to bring the cleaner up from downstairs every time I use it. My wife wouldn't mind having two cleaners at one time. I decided to buy a new one. I looked for the best one for my house on the internet. There were many kinds of electronic cleaners. I felt so much effort from the designers behind them. Anyway, they had a variety of functions. I wondered if there were automatic cleaners that could work automatically like a kind of a maid. Whatever excellent cleaners they were, I have to squeeze some time to use them or make them work. I wish but never hoped that there would be automatic maid-like cleaners. However, quite to my surprise, there was a cleaning robot which might save my time. I ordered this one immediately. The price of this cleaner was higher than the vacuum cleaner. I found that this was made by a U.S. company. The cleaner itself might be produced in China, but if the company was in the U.S. it might be smart to buy it in the U.S. because of the strong yen. I was afraid that the procedure might be complex, but I placed an order to the U.S. at about 23 hours on Nov. 20th in Japanese Standard Time and I got an e-mail from the company in Los Angeles the next morning saying "We received your order at 17:19 on the same day, Nov. 20th 2008". Next, I got another e-mail saying "The package had taken off from Los Angeles at 3:23 on 21st. The next e-mail said, "The package arrived at Narita International Airport at 7:55 on 22nd and is awaiting customs clearance procedure". The latest e-mail said "Entry was permitted". The robot looks like coming to my house bit by bit. I'll report it here after a few days of trial. At any rate, the world is getting smaller. I really felt so. My wife has gone to France. She works for a trade school for care workers and accompanied the school tour for a week. She had been to Europe every two years. The countries she visited before were France, Italy, Great Britain, Switzerland and Belgium, which I've never been to. Whenever I told her that I was envious of her, she replied that she had had a rough time with students who didn't know anything about countries outside of Japan. It might be true, but she was sightseeing in the Bastille prison when I called yesterday. I wish I had visited Europe. According to the yesterday's TV news, Iceland are about to go bankrupt now. If Iceland were a company or a household, I would understand or imagine how it could be. However, Iceland is a country that is a member of the UN. What will become of Iceland. I was thinking something like that during the last night's dinner. At that time, I came up with a great idea suddenly. "Go and see Iceland!" I felt someone shouted behind me. The strong yen would be favorable to me. I looked for discount tickets on the internet and found that the price was not so high. Spring wouldn't be a high season in Iceland. The climate of the land of Ice would be so harsh, I guess. In the morning, when I asked A her schedule of next spring break, my wife screamed, "Wasn't last night's story kind of a joke?" "No, I'm serious," I answered. She continued, "A is preparing for university exams. Are you insane?" Finally, our half-made plan was stopped. Hang on! My wife just said, "It wasn't good for A, not me." I'm thinking that I would take my first or second daughter with me. My first daughter can speak French and my second daughter, German. At least both are better speakers than I am. I mean both are convenient in Europe. My wife doesn't know this idea is still smoldering in my mind. Nothing lasts forever. I think it is true. Our history obviously demonstrates it. I'll write on a deep but simple issue this time. You'll know that my idea is perfect if you read your history textbook carefully. Many countries which have come into the world have prospered, gone into decline and perished since recorded history. Whatever became of once-prosperous countries like Egypt, Greece, Rome, Turkey and Mongolia? No country can be prosperous forever at the same time as no one can live forever. In recent eras, the hegemony altered in the order of Spain, Holland, Great Britain and the U.S. The opponents of this hegemony changed like Portugal, France, Germany and the U.S.S.R., in this order. There's no exception to the life cycle of nations. Once a country loses its supremacy, that country never goes back to its original position. This life cycle can't be staved off. This is the absolute truth in history. Barack Obama won the U.S. presidential race. I wonder if the U.S. will get better or worse under his policies. I suppose that the best era of the U.S. was around 1945, just after the end of the second world war. It was only the U.S. that had nuclear weapons at that time. European and Asian countries were exhausted because those countries were the battlefields, while the mainland of the U.S. was intact except for isolated bombings by Japanese balloon bombs. What will become of the U.S.? 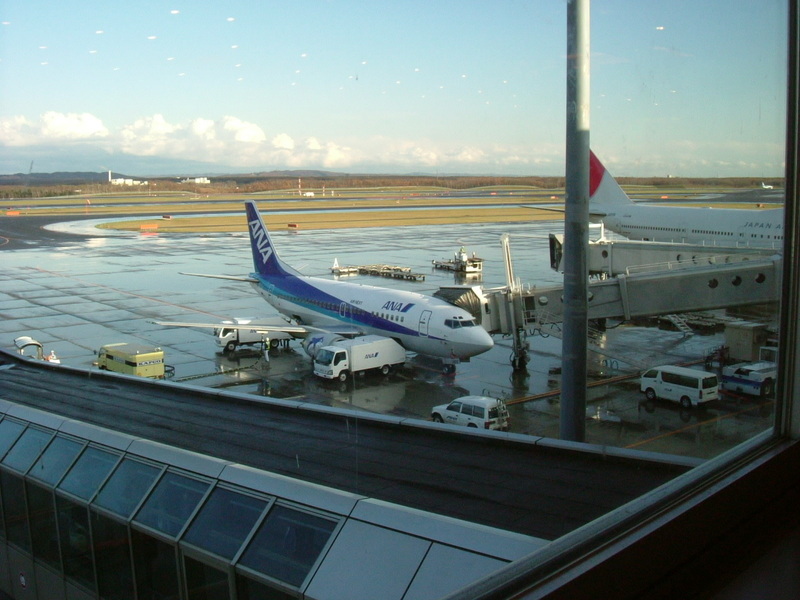 We arrived at Shin-Chitose Airport just as scheduled. 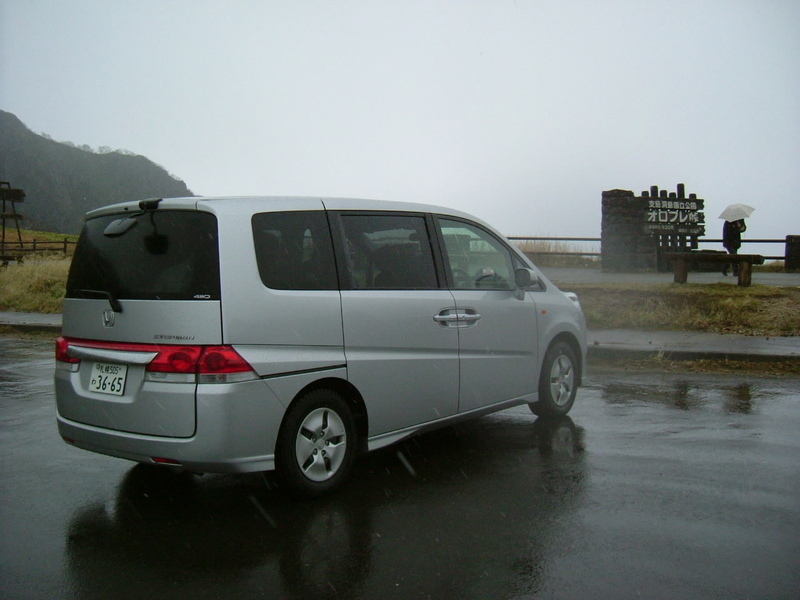 We drove our car in the snow and rain all the way from Orofure Pass to Chitose City. It seems like I might be a rain bringer, especially in Hokkaido. Anyway, as usual for my departure from Hokkaido, it got clear in the sky. Why is it always like this? We enjoyed shopping individually and got together again at a restaurant. 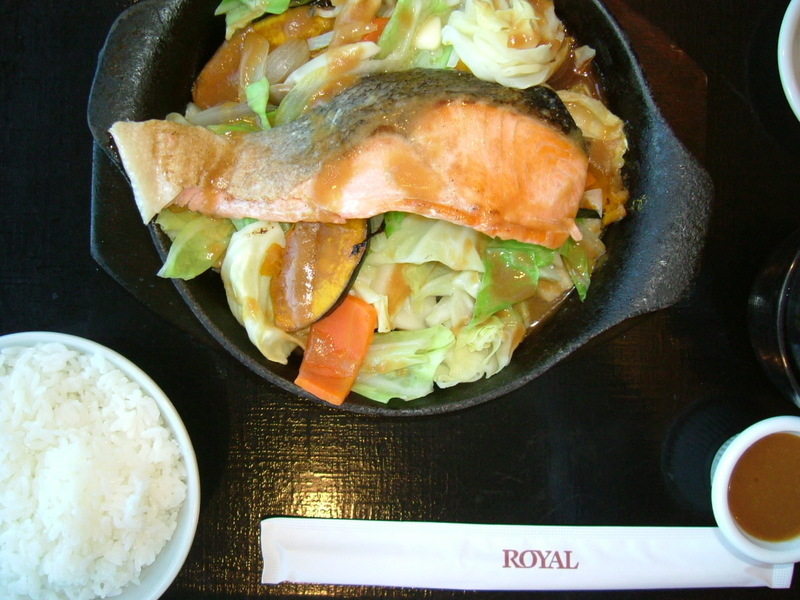 I had a local dish, Chan-Chan Barbecue, which is grilled salmon and vegetables. Beer? Naturally, I got a local beer. I'll show you below. 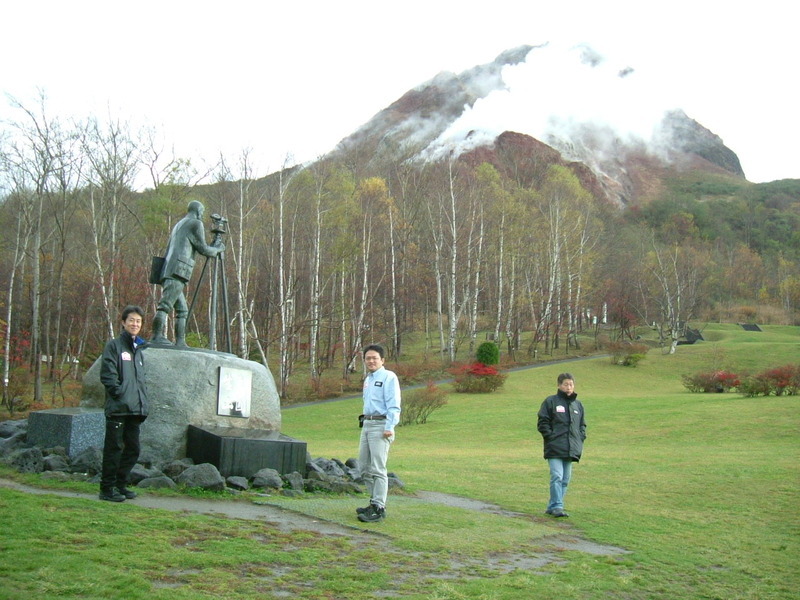 Toyako is also famous as the place of the 2008 summit. 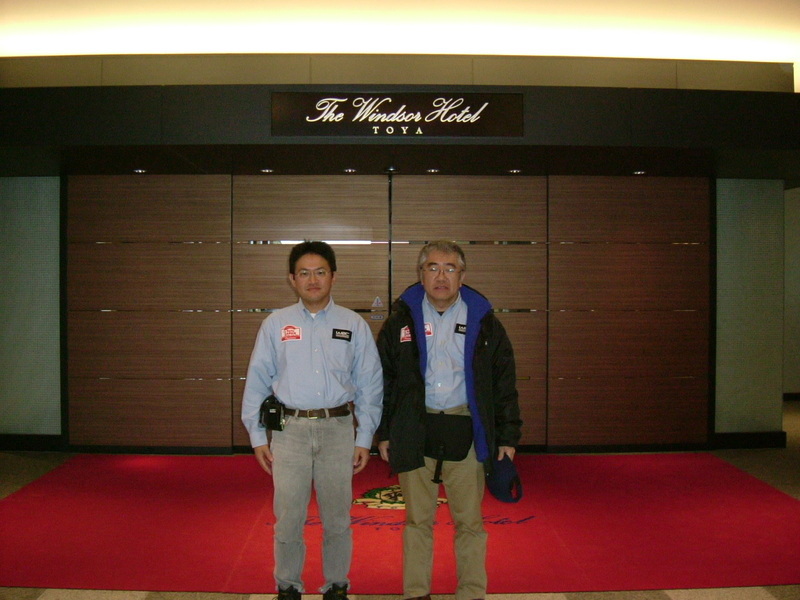 The Windsor Hotel TOYA was chosen as the summit site in terms of security. This hotel is located at the peak of the mountain and there is only one approach route. If terrorists wanted to attack the hotel, they would need missiles. We took a rest in the hotel lobby, where G8 leaders had chatted. The second picture was taken just in front of the entrance. A valet was kind and took it. 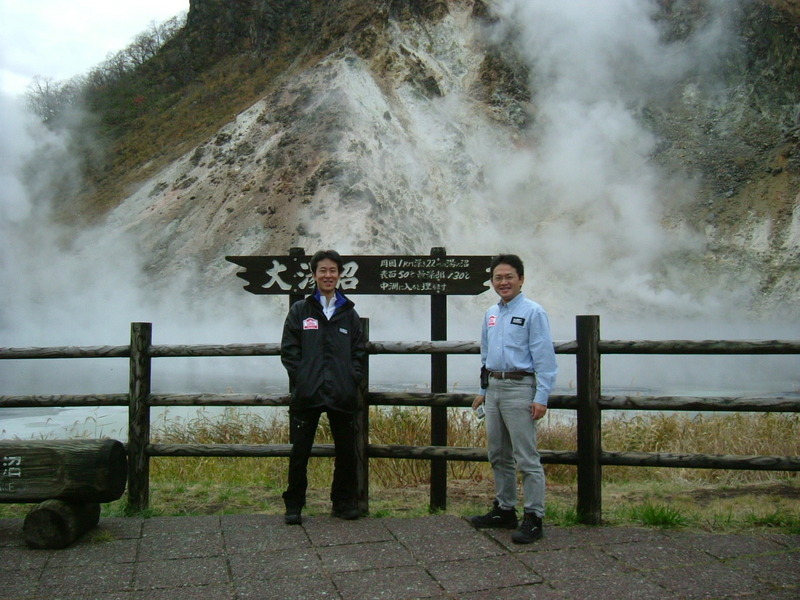 Toyako Lake and the mountains around the lake are noted for its active volcanism. This area has evidence of several eruptions since recorded history. Showa-Shinzan, which is shown in the first two pictures, is the lava dome and was formed only in two years during the Greater East-Asian War. 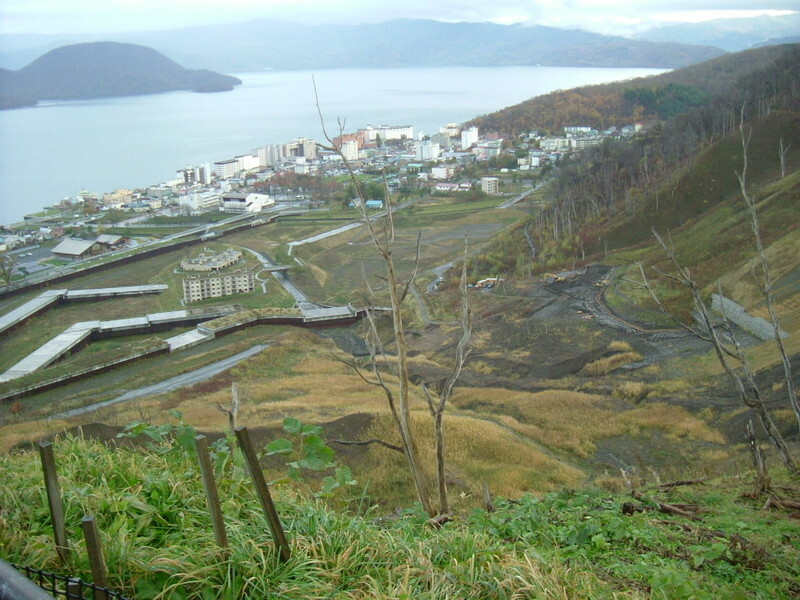 The last picture is Toyako Lake and the devastated area from the eruption in 2000. We left our hotel for Sapporo about 7 o'clock. It was the last day and we had to fly back. We dropped in at several spots on the way to the airport. The first two pictures were shot in Noboribetsu Hot Spa Area. 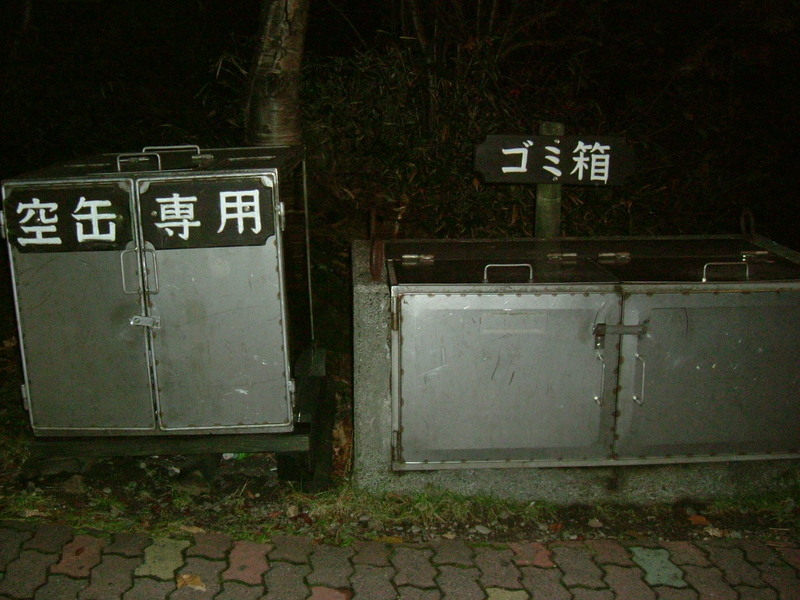 The second picture is Oyunuma, which is one of the sources of Noboribetsu Spa. After taking pictures here, we went up the hill and ended up with seeing snow at Orofure Pass. The next two pictures are us and our minivan at the pass. We roamed through the busiest street. I'm showing you some pictures that were taken there below. The 1st picture is a Japanese pinball parlor. 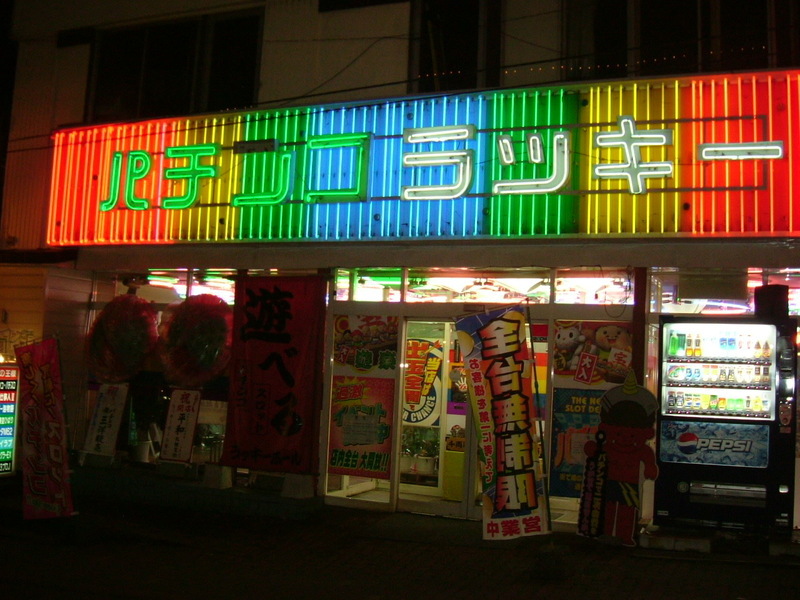 Japanese pinball is called "pachinko" and pachinko parlors have developed as well as lots of other industries, but this parlor looked like one from 20 years ago. I felt a kind of nostalgia. 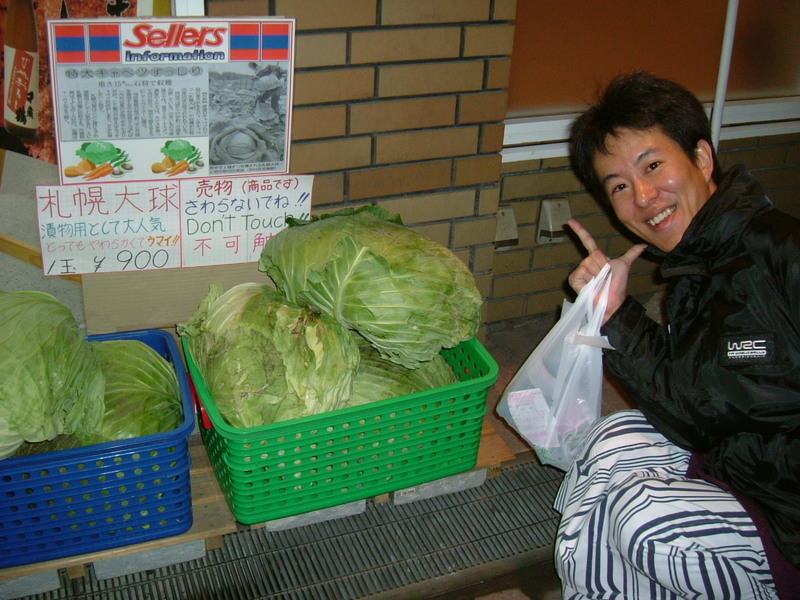 Next, I found incredibly big cabbages by the street. I didn't know how they had grown, but it might be due to the earth's heat. People started getting back to their hotels and the street was getting sparse in the 3rd picture. 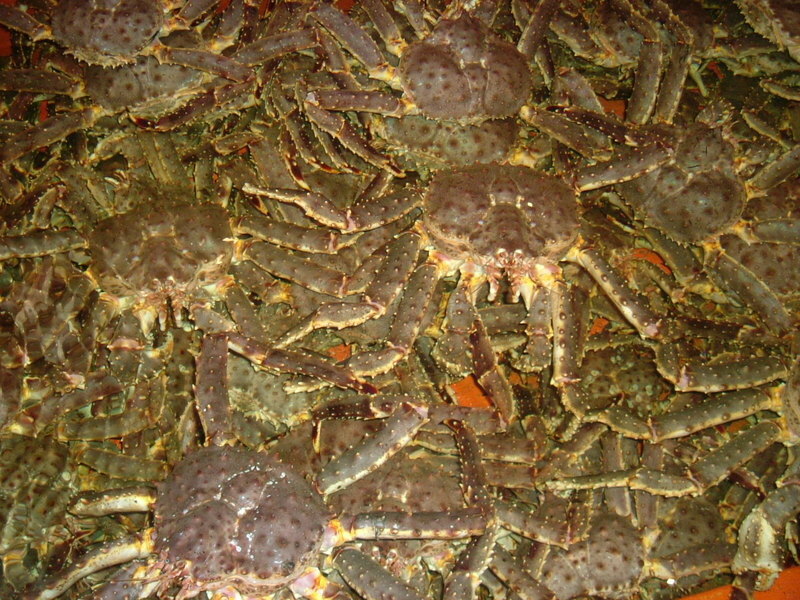 The 4th picture is a stock pool of Alaska King crabs. After the spa, we took a walk around our hotel. 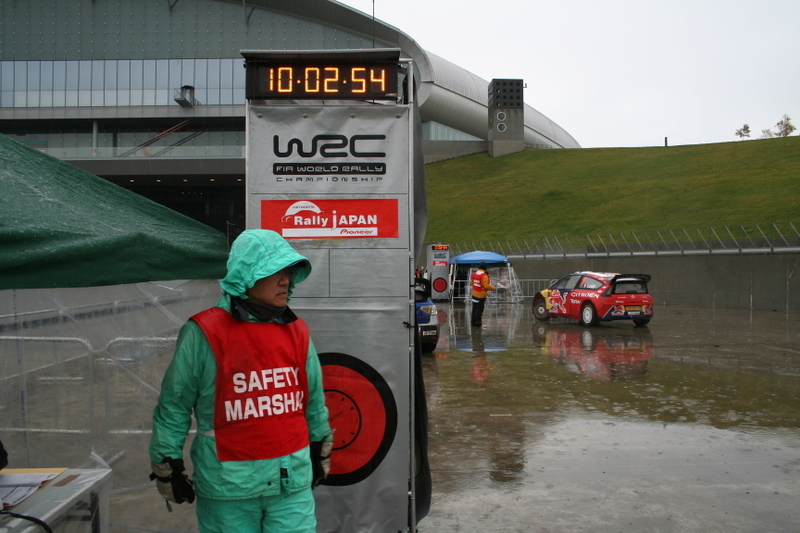 It was very cold outside and we put on the official uniform of Rally Japan 2008. With the effect of the spa, we didn't feel cold and it was comfortable for walking. We came across the signboard of "Jigokudani" which means hell valley and took this picture. This place spews out boiling water 24 hours a day and had no plants and animals. It was just like hell and named so. After a while we found a robust garbage box with a lock. It sounded like bears couldn't open it. Food scraps would be a delicious food for bears. 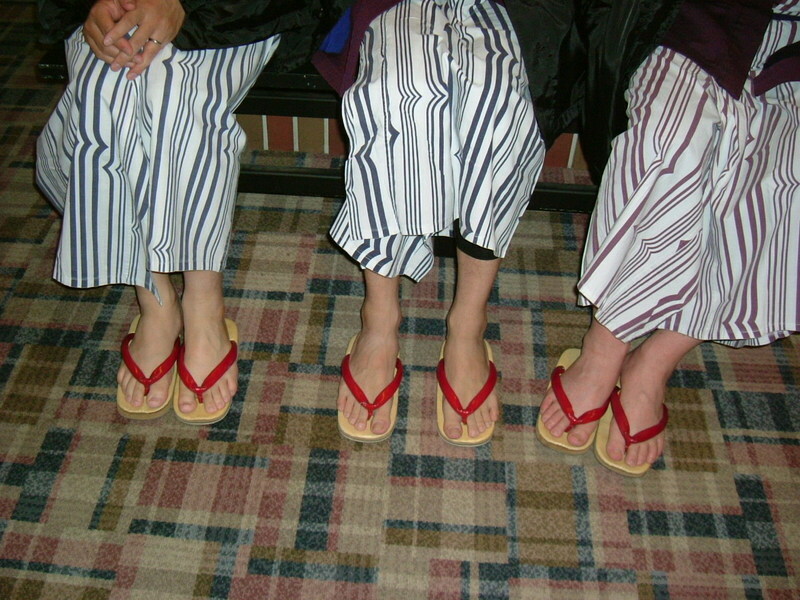 As soon as we got to the hotel in Noboribetsu, we headed for the spa. Noboribetsu is one of the famous spa resorts in Japan. 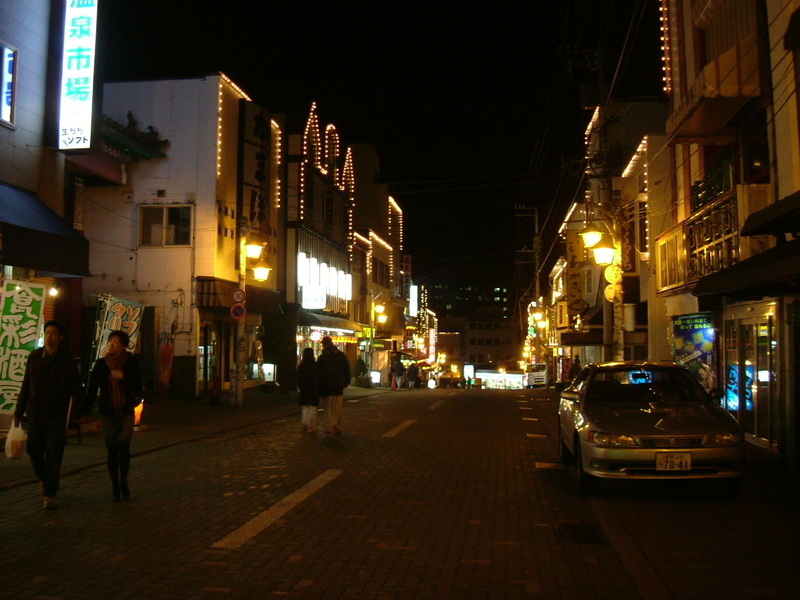 It is 1 hour's straight drive from the airport of Sapporo and very popular among tourists. I saw Russian and Korean tourists groups at the spa. Actually we had another plan. 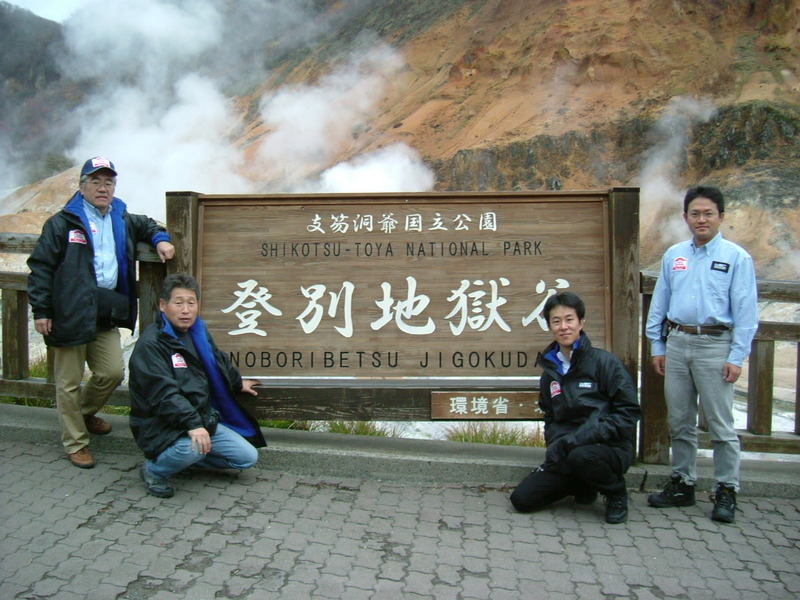 We were planning to visit Noboribetsu Onsen Hot Spring after the Japan Rally. 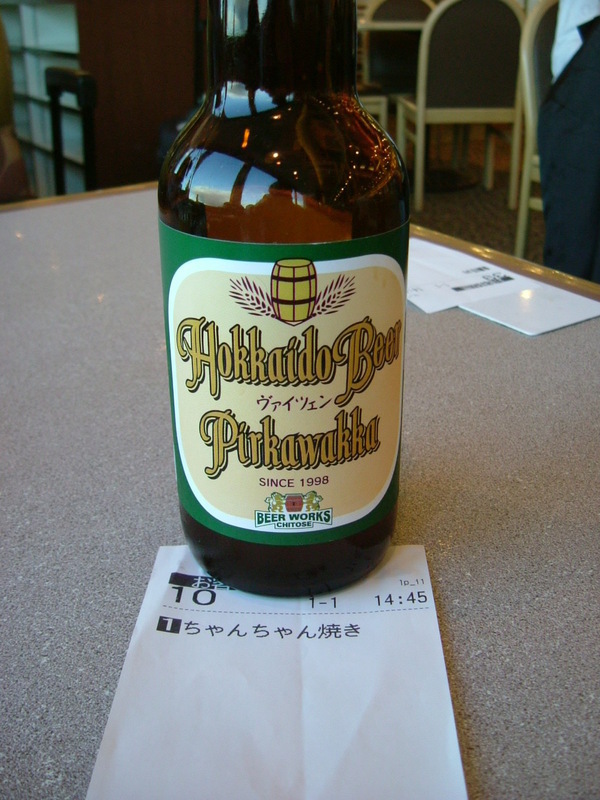 Our hometown is far away from Hokkaido and we couldn't visit Hokkaido so often. 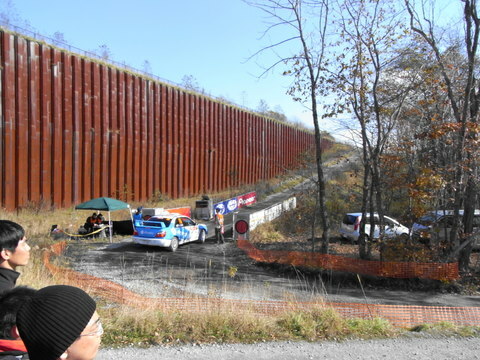 This rally was a good opportunity to visit Hokkaido. As soon as we got free from the rally, we rented a minivan in downtown Sapporo City and went out of town heading for the south. Amazingly, the weather had changed to be worse again and we had rain with snow. 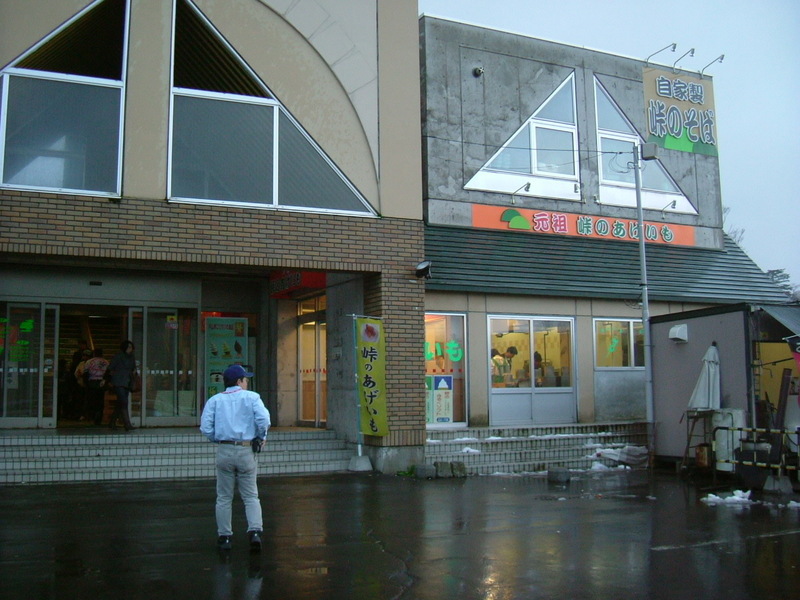 We dropped in at a famous resthouse at Nakayama Pass to get some hot drinks or food. We were supposed to be able to see the magnificent Mt. Youtei, but couldn't due to thick fog. The Japan Rally was over. More properly, our duty was over. 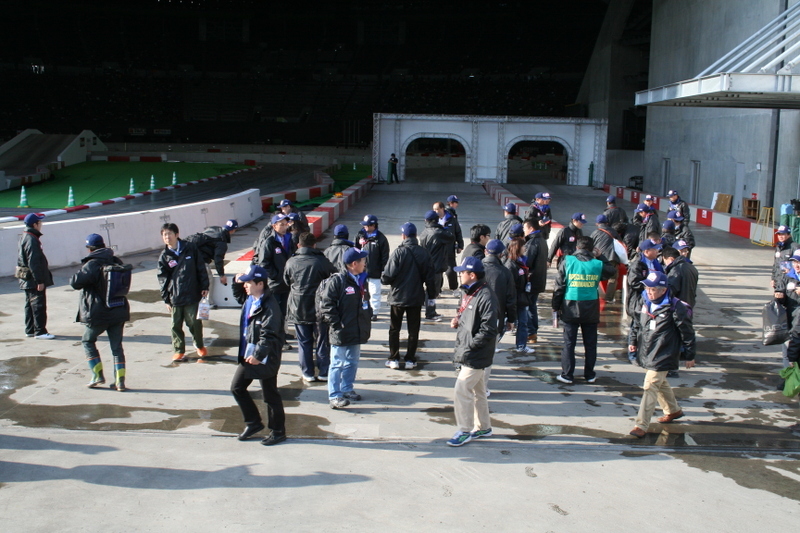 The rally cars were on the way to their goal, but we were released from all the duties of the rally. Our faces were full of content. 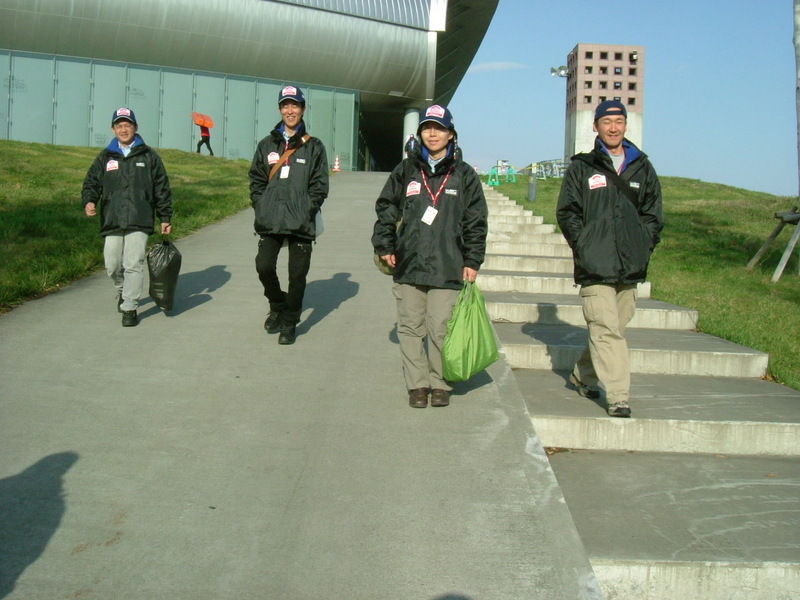 The person who is on the right in the first picture was from Tomakomai City and took us between our hotel and the Dome every day. He was kind and took us to the car rental agency after we were dismissed. We found a few people washing their damaged car on the way to our parking. 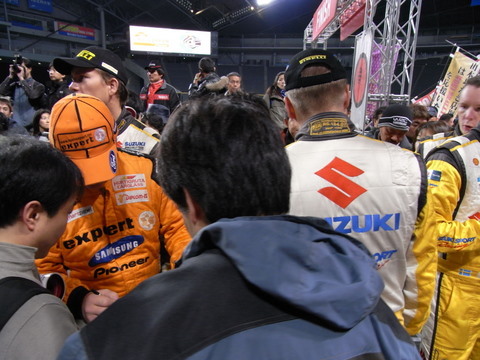 I hoped that they could complete the next rally. By the way, I wondered if the weather in Sapporo was always like this. It was fine in the early morning, heavily raining until noon and now it is clear again. The second picture is at the start point of one of the special stages. 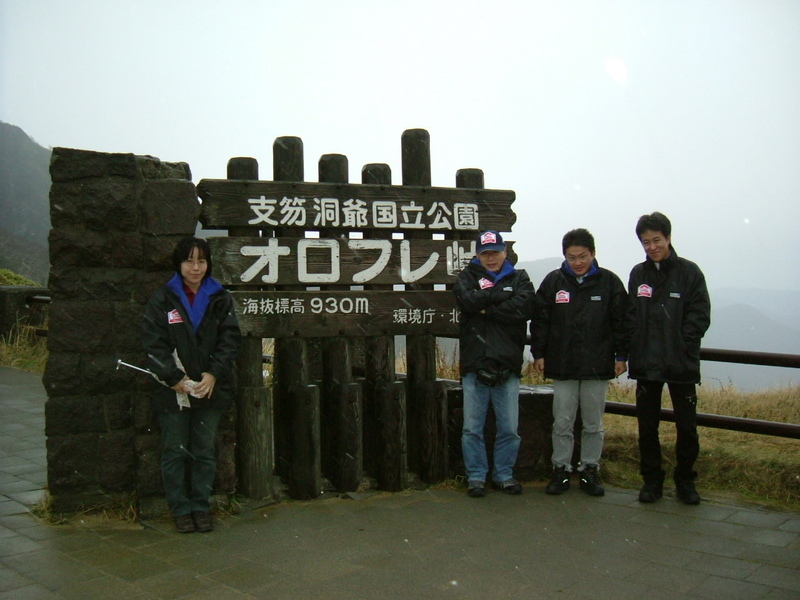 The picture shows all the members of F Mountain. I'm nearly in the center of the group. 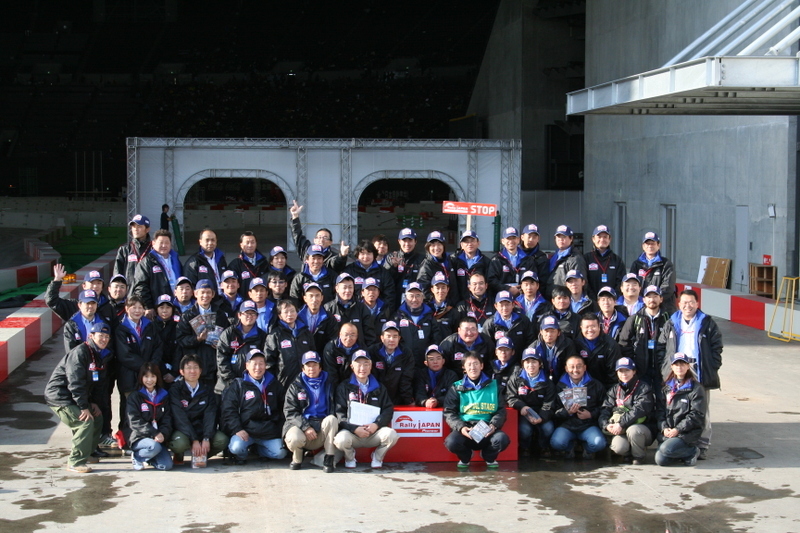 The competition in the Sapporo Dome was managed by this group. This picture was taken about three hours later than the picture in the last entry. As you can notice, it had stopped raining. The weather was getting better. I'm walking with my left hand scratching my neck in this picture. I am on the right of this picture and walking. I'm waiting for about the last ten rally cars in the picture. 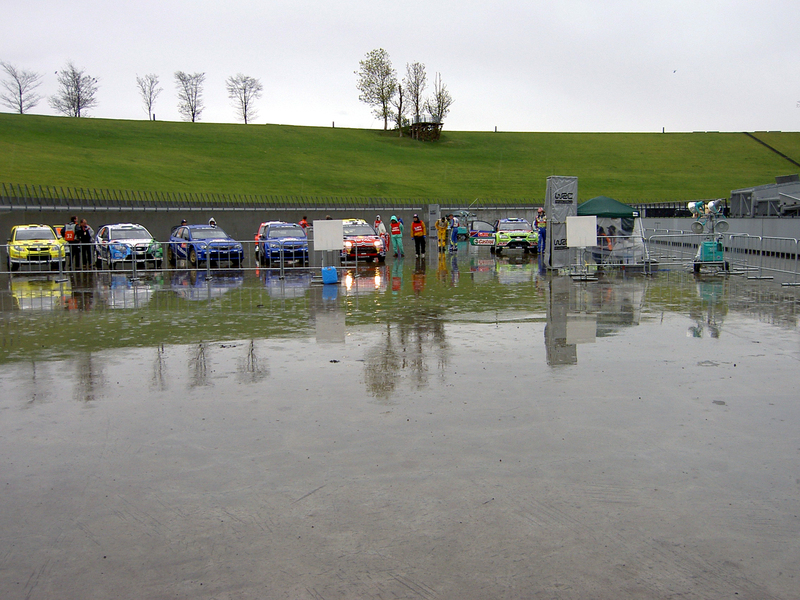 These cars were damaged to some extent and managed to come into the Parc-Fermes. That is to say, they didn't come in as scheduled. I was bored and wasn't interested in these cars and hoped that I would finish soon. The picture shows my look of irritation. It was after quite a while that I walked around in the rain. You might suspect that I am peculiar, but I don't hate wandering in the rain. I guess that I got used to spending time outside in the rain due to mountaineering. 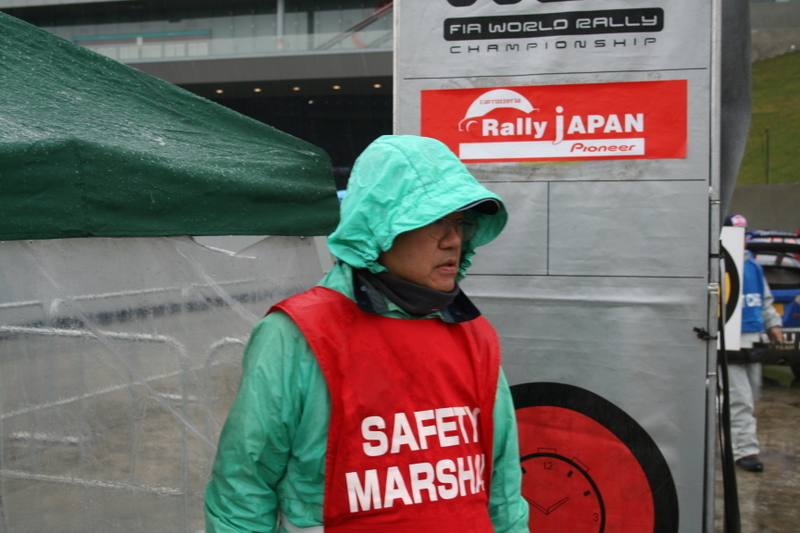 While I was working in the rain in this rally, I found that I'd been away from full-fledged climbing for a long time. These green raincoats were originally climbing gear. 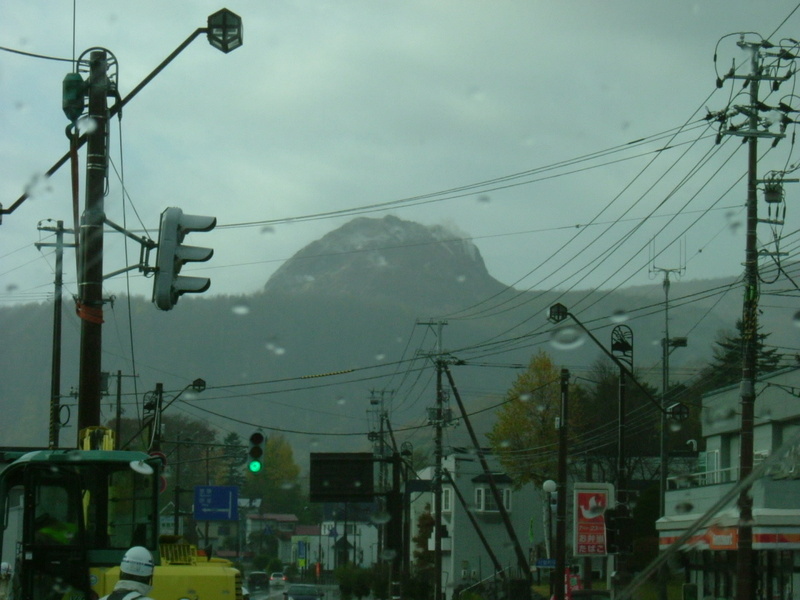 I was recalling the scenes in which I encountered harsh rain in the mountains. I just started thinking of climbing on my next summer vacation. Anyway, look at the picture. You can see the Citroen rally car behind me. It is wonderful that I am in the picture with such a car that I could see only in calendars, magazines and on TV. Do you know who was the person beside me in the picture? 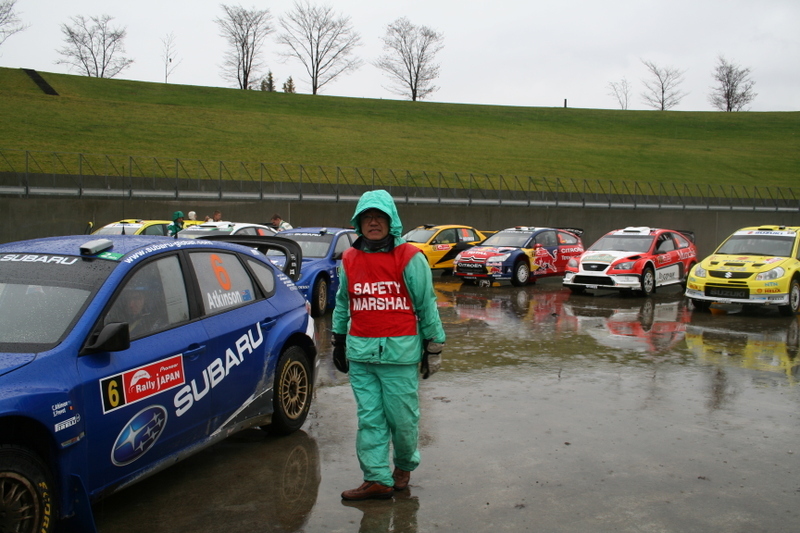 He was Mr. Atkinson, who was driving a Subaru, car number 6, in the rally. Needless to add, he was one of the top rally drivers in the world. It was when I just turned around that this picture was taken so that the photographer could make the excuse that I was in the picture by chance. He took this picture for me, but in order to conceal the real intention, I was told to walk or behave naturally. Anyway, I was happy to look at world class rally cars at such a short distance.